Did you know that Friends of Brook Park has its very own Farm Share? The Corbin Hill Winter Farm Share offers all sorts of fresh produce for your family — delivered straight from New York State farms! * A Winter Share produce box — packed with items such as hearty greens, cabbage, carrots, beets, onions, apples and greenhouse lettuce, always selected based on what’s in season and grown in New York State using sustainable farming methods. * Extra shares, including a Dozen Egg Share, a winter Fruit Share (apples, plus one preserved product), a winter Bean Share (two types of beans, one pound of each) — PLUS two new shares, a Dairy Share (butter, yogurt and cheese) and Bread Share (multigrain loaf and corn tortillas). * A la carte “Add-On” options including honey, maple syrup, jam, tea, and farm-made lip balms and hand salves. How to sign up? Visit Corbin Hill’s Winter Farm Share Guide for all the details, including information on the reduced-price “Money Match” program for SNAP (food stamp) participants. If you know of anyone not online, Corbin Hill also has paper enrollment forms available in English and Spanish. Winter deliveries are the second Tuesday of the month (February 10 and March 10), and the deadline to sign up for each is the second Tuesday of the month (February 3 and March 3). Delivery is from 4-7 p.m. You need to sign up in advance so that there will be a delivery for you — so do it now! The next deadline is a little less than a week away! Questions? Contact Corbin Hill at info@corbinhillfarm.com or 646-793-0033. 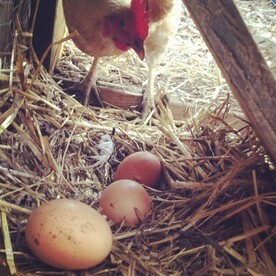 We have a new egg and maple syrup CSA in Mott Haven! You can order one or both and we are hoping to have all orders in by Wednesday to fill our egg requirement of ordering 50 dozen! 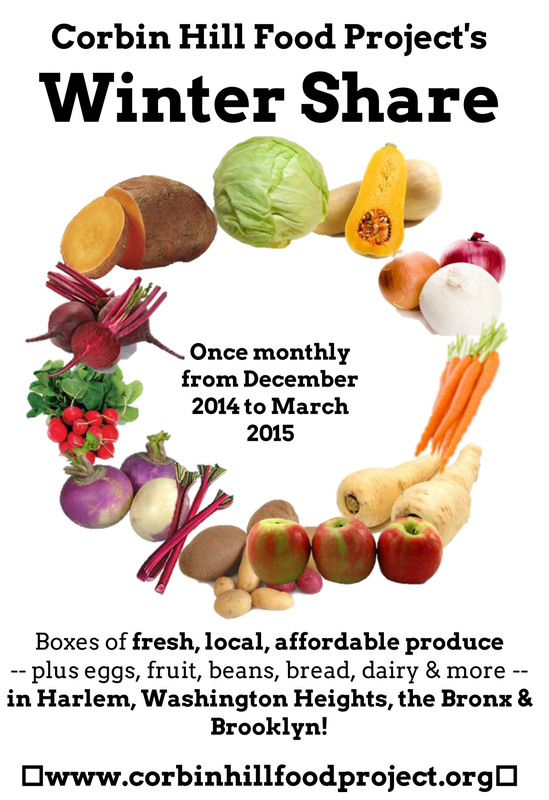 Eggs are just $4.75 per dozen and the CSA is one delivery per month for five months! Such a great deal! The eggs are from Trinity Farm, our local farmer who was selling at the market this summer! 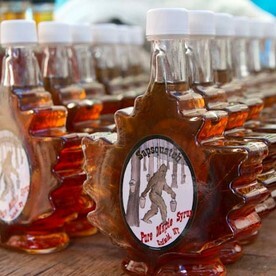 The maple syrup will be delivered to my house in late April and is $80 per gallon. You can choose between grade a and grade B. We did a small CSA last year with the syrup and it was fantastic! The best part is you can order it all online! Here is the online link and please feel free to share with friends and in social media because we welcome lots of folks to sign up! We participated in a recent planning session for our local Saw Mill Playground, right across the street from Brook Park. 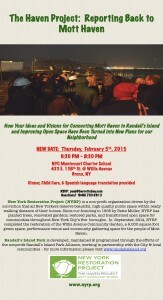 Concept Plan presentations for Saw Mill Playground and Ranaqua Park will be held on 2/26/15 at 5:30 PM, at the CB#1 Office, 3024 Third Avenue, Bronx, NY 10455 (corner of E. 154th St.). Please share your input HERE. (Scroll down to the grey “Share Your Input: Saw Mill Playground Reconstruction” box, and click on “Share Your Thoughts”). We hope that everyone had the chance to share their thoughts with us last night, however, if you missed the opportunity to speak, or have additional follow-up suggestions or concerns you would like us to consider while developing this plan, please share your input HERE. (Scroll down to the grey “Share Your Input: Saw Mill Playground Reconstruction” box, and click on “Share Your Thoughts”). Online comments will be accepted through January 27, 2015. Based on the input we received yesterday evening, NYC Parks will develop a conceptual plan and a subsequent schematic design for capital improvements to present at your local community board office. 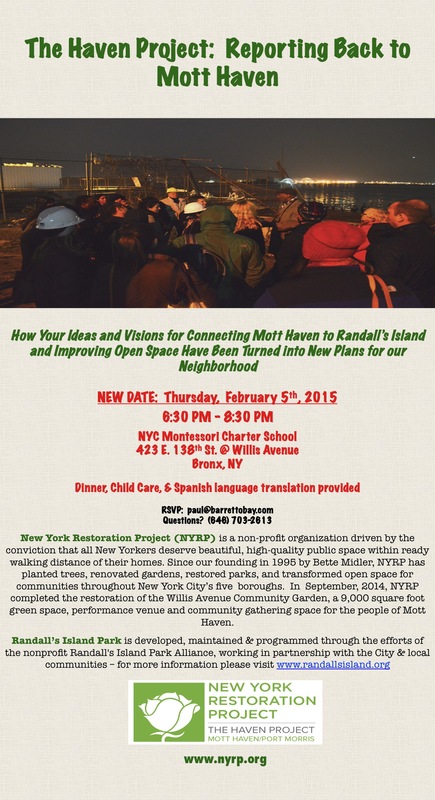 The date for this initial presentation about SAW MILL PLAYGROUND is Monday February 9, 2015. Later this spring, we will be hosting an informal meeting on ways local community members can organize and collaborate to program events and activities at SAW MILL PLAYGROUND. Since you have demonstrated active interest by attending the input meeting last night, I wanted to bring this future opportunity to your attention. I will be reaching out in the coming weeks with more information on how to participate in the reconstruction of SAW MILL PLAYGROUND. In the meantime, if you would like to learn more about how CPI fits into the Park Department’s Framework for an Equitable Future, please visit www.nyc.gov/parks/cpi. Thanks again for your efforts and commitment to improving SAW MILL PLAYGROUND! Learn about the newly launched Community Parks Initiative (CPI) and see which parks were selected to participate!